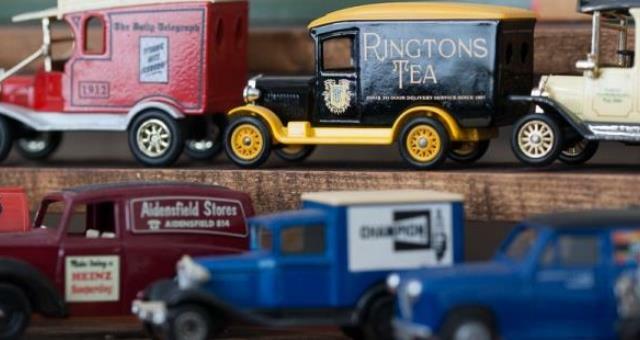 Cloverlands Model Car Museum01686 668004work Museum - MotorMarques include Bugatti, Bentley, Mercedes and Rolls-Royce cars together with Grand Prix and World Land Speed Record breakers, buses, trams and vans of every description. Two superstar models - over three feet long – reign over their lesser subjects. One is a Singer Le Mans – a replica of a car, Miss Rogers owned and drove for forty years until 1998.. The second, Madame Cloette, was probably the forerunner of Brum – a feisty car hero of children’s TV in the Nineties. Marques include Bugatti, Bentley, Mercedes and Rolls-Royce cars together with Grand Prix and World Land Speed Record breakers, buses, trams and vans of every description. Two superstar models - over three feet long – reign over their lesser subjects. One is a Singer Le Mans – a replica of a car, Miss Rogers owned and drove for forty years until 1998.. 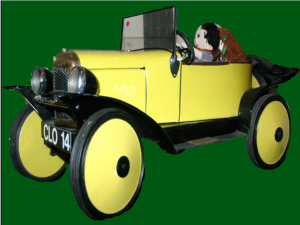 The second, Madame Cloette, was probably the forerunner of Brum – a feisty car hero of children’s TV in the Nineties. More than just model cars – Cloverlands is a sublime piece of motoring social history, lovingly compiled by an early motorist. Miss Rogers not only collected, but built and commissioned, models large and small. She visited Le Mans and the German Nurburgring and was a member of the Veteran Sports Car Club for many years. 100 yards from the Dragon Hotel-open all day, and two cafes for your delectation.Parking is FREE,but if parking is a problem,why not park at the castle and walk down pastThe Dragon Hotel.Extra parking 300 yards away. Note: Please check by phone before travelling any distance to visit us. Other days by prior arrangement. The Museum is located in the Montgomery Institute, Arthur Street in the centre of the town, 75 yards from the iconic hardware shop Bunners which is a tourist attraction itself.If they haven't got what you need it hasn't been invented.